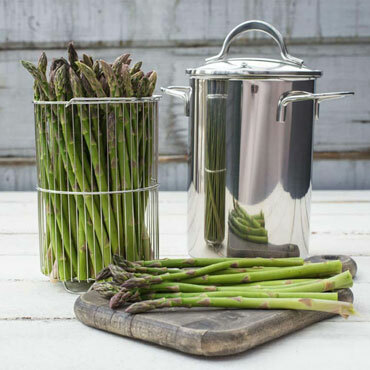 Whether you've harvested your own asparagus from your kitchen garden or brought home a fresh bundle from the grocery store, this steamer makes it easy to prepare a batch large enough for the whole family to enjoy. With a 3.5-quart capacity, we've made this steamer to stand tall and narrow with a built-in colander, cooking the ends of the asparagus stems while gently steaming the delicate heads. You'll love them drizzled with olive oil, sprinkled with salt and pepper, and tossed with minced garlic. Don't forget to try it with other vegetables, too. You can easily steam carrots and broccoli to get them just as tender as you like.